Thermoelectric materials have the ability to directly convert heat into electrical power. These generators have found applications both on Earth and abroad, with the most notable example as power generators for NASA’s long-range space crafts, such as the Voyager space crafts. Currently, there is a huge drive to increase the efficiency of these materials to expand their uses and power outputs. 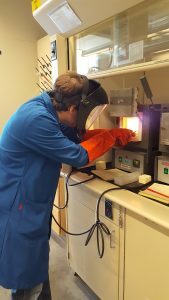 My work focuses on a promising class of thermoelectric materials called clathrates. Clathrates are described as a 3-D space-filling framework of polyhedra that often have guest atoms or molecules trapped within the polyhedra. While traditionally intermetallic clathrates have frameworks made up of group 14 elements (Si, Ge, Sn), I work on clathrates whose frameworks are composed of a late transition metal and group 15 element (P, As, Sb), such as Cs8Zn18Sb28 or Cs8Cd18Sb28. These clathrates are highly desirable due to their ability to tune their electronic properties without increasing their thermal conductivity, a property that must remain low to have an efficient thermoelectric. I am working on boosting the efficiency of these materials through the substitution of their frameworks.